Glasgow University Amnesty International » More News! 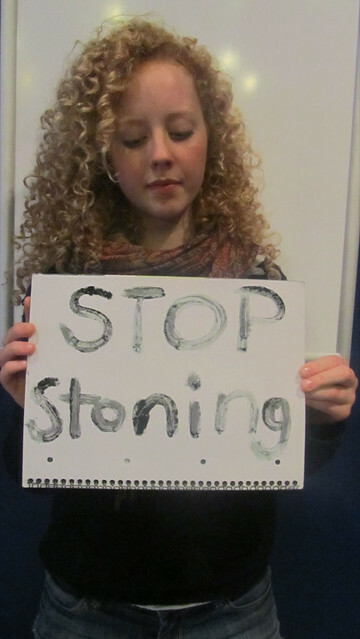 Firstly, a biiiig well done to all the campaigners who stood on library hill last Wednesday for our End Stoning campaign. We were there for just over two hours and collected an amazing 458 names! Thanks to everyone for your time and enthusiasm! We’re in Qudos in the QMU on Tuesday at 5pm and we’ll be focusing on human rights in Burma, as well as planning publicity for upcoming fundraising events (see below!). – Protect the Human club night at Stereo, Thurs December 1st: In the coming weeks we need to people to PR for this, but the most important thing to is to come and have a drink and a dance with all proceeds going towards Amnesty! – Christmas caroling: This week we’ll start organising this properly and get an Amnesty choir together in preparation for caroling in December. Join in whether you can sing or not!